Choosing the right personal water filter for your next hiking or backpacking trip is an integral part of your preparations. Drinking contaminated water that contains harmful pathogens or chemicals will result in you falling sick in the middle of your camping trip or hike. Water is the most important substance that your body needs after air, even more important than the food that you eat. To prevent yourself from falling victim to dehydration, diarrhea, stomach pains, etc. you must carry a portable personal water filter inside your backpack that only you will use. 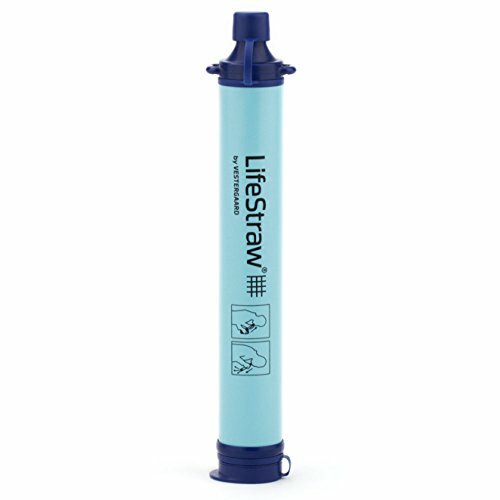 The LifeStraw is probably the most popular personal portable water filter in the world. It is famous among survival enthusiasts and campers due to its incredible blend of filtration power and portability. Not just that, it also filters water extremely fast. You just have to dip the input side into a water source, and sip from the other end. To clean the physical filter inside the LifeStraw, all you need to do is blow into the thin orifice from which you sip filtered water. That will blow out most of the impurities trapped inside the filter. Basically, you just have to use it like a regular straw – sip to drink, and blow to clean. The filtering system inside this simplistic device is capable of removing 99.9999% of waterborne bacteria (without using chlorine, iodine or any other filtration chemicals). It also surpasses the EPA standards for water filters. The physical filter in the LifeStraw will filter up to 1000 L of contaminated water straight from the source, before you need to replace it. It is capable of filtering up to .2 microns, and the whole LifeStraw weighs just 56 grams, and measures only 8.86” in length. 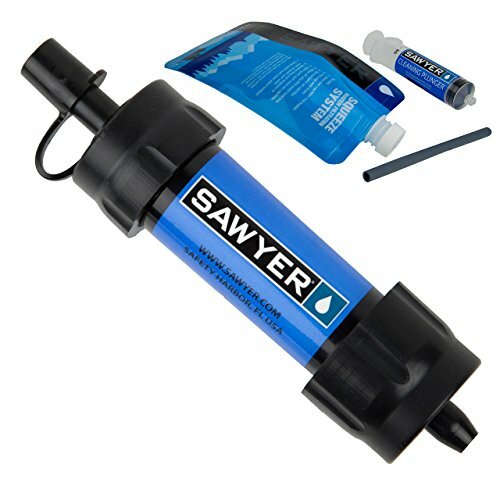 The Sawyer Mini is perfect for hiking trips, excursions, and outdoor adventures in which you need a handy little filtration system that conveniently fits into your backpack. The Mini will attach to the provided squeeze pouch so that you can conveniently drink water directly from the pouch, like sipping from a straw. The squeeze pouch can be filled by running it through a water source, and the filter is only a few inches long, meaning that it will fit in the palm of your hand. The removable filtration straw inside the cylindrical blue body can filter up to 100,000 gallons of water before you have to replace it. Also, it is a hollow fiber membrane inline filter with a 0.1 micron filtration rating. A cleaning plunger is provided so that you can conveniently clean out any trapped impurities that are clogging the straw. This filter is capable of removing up to 99.99999% of bacteria such as salmonella, E. coli, and cholera, along with 99.9999% of Protozoa such as giardia and cryptosporidium. Featuring the most filtration power of any portable straw-style filter on the market, the Survivor water filter is capable of removing up to 99.9% of all bacteria, protozoa, and viruses from even the dirtiest of water sources. 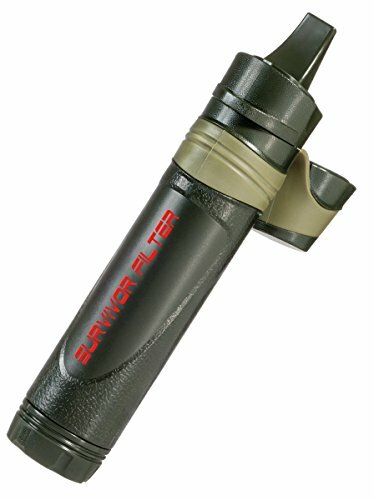 The Survivor features a 3-stage filter, which includes an activated carbon filter, an ultra-membrane filter, and cotton pre-filter. All of this results in a net filtration rating of 0.05 microns, which is anywhere between 2 to 4 times better than what most current straw filters can offer. The body is made from military-grade ABS plastic, while the internal straw filter can handle up to 1000 liters of dirty water before you have to replace it. Flow rate is a whopping 200 ml per minute, and net weight is just 100 grams. The purification method used in a water filter determines how well it can filter out the impurities and pathogens from the water. There are 3 primary types of water filtration- physical, chemical, and UV. Portable water filters may contain any one of these filtration methods, or a combination of multiple methods. Physical methods involve the use of a physical water filter that removes impurities and suspended particles up to a certain size. Activated carbon filters are capable of filtering out particles that are just a couple of microns in size. Chemical filtration methods use a chamber laced with reactive chemicals that kill pathogens and remove certain suspended or dissolved impurities from the water. UV is the most reliable way to kill pathogens, and kills all sorts of bacteria, protozoa, and viruses. The size of the filter will determine how well it can fit into your camping or hiking backpack. You certainly don’t want to miss out on tools and important gear just because you’re putting a water filter inside your backpack. UV filters will generally weigh more, and could be larger than regular physical or chemical filters. Choose the filter that offers a nice blend between filtration power and portability. Filters with chemical + physical filtration layers are usually good at keeping the size low while also maintaining 99.9% filtration rates. The most simplistic water filters are the most reliable ones. By reliability we don’t mean filtration rates alone, instead we are referring to how well the filter performs over a period of time. Some physical filters tend to get less reliable after multiple usage cycles, and their filtering power decreases until you replace the filter cylinders or straw. UV filters are great, but the problem with them is that they usually require one or more batteries to work, and if your batteries run out juice – you’re filter is totally useless. That is why you should always carry a straw filter or similar physical filter. Normally this is not that big of a concern in a hiking or camping trip. Most water filters can effectively filter large quantities of water within 20 minutes to 1 hour. But let’s say you find yourself in a situation where you just found a water source such as a stream, river, or lake, after searching for a long time. Or maybe it is about to rain, and you need to get back to camp really quick. In any situation where time is a limiting factor, you’ll find out that quick filtration can really come in handy, and the fastest portable water filters are simple straw based filters. If you have decided what qualities you need in your filter, then take a look at the above 4 water filters that we picked on the basis of their filtration power and reliability. All of them are extremely popular among outdoor enthusiasts, survival experts, and avid hikers. Choose the one that suits your needs the most, and pick a filter that maintains a good balance between filtration power and portability.